In some cultures there had always been a warrior class and a scholarly class. From their youth boys were divided and raised accordingly. The two groups seemingly had nothing in common; one was raised to be a soldier, the other a scholar. Soldiers never rose up the ranks to be generals; the general came from the scholarly class. Among the people of Israel this has never been the case. From the days of the Bible we have always had the warrior/scholar. Even the rugged warrior was bound by the laws and morals of the Torah, even the scholar had to be trained for war. Our ancient prophets were warriors and scholars. King David was the epitome of the warrior/scholar. The judges of Israel; Samson, Ehud Ben Gerah, Deborah, were all warriors. They acted as judges and leaders, and they led the troops in battle. Deborah did not lead the troops in battle but did plan the strategy. This tradition continues today. In the religious academies of Israel this tradition is part and parcel of daily life. The study of Torah and the preparation of military service go hand in hand. It is well known that religious soldiers have been in the forefront of the most dangerous battles and have risen to the highest ranks. The State of Israel and the Israel Defense Forces recognize that religious training should be provided for all, even the self proclaimed secularists who do not follow a traditional Jewish life style. The army provides training in basic Jewish concepts and values; they understand that, in Israel, this is an essential part of being a complete soldier. We are a people's army and this people must know what they are fighting for. Every soldier must study the history of our people, it's warriors and leaders. They must know that long before them, other Jews, from the earliest Hebrews, fought to protect this land. Where they fight now their forefathers fought before. Abraham, Joshua, Yiftach and Gilad. They were all here. This history is the Bible, the Torah. 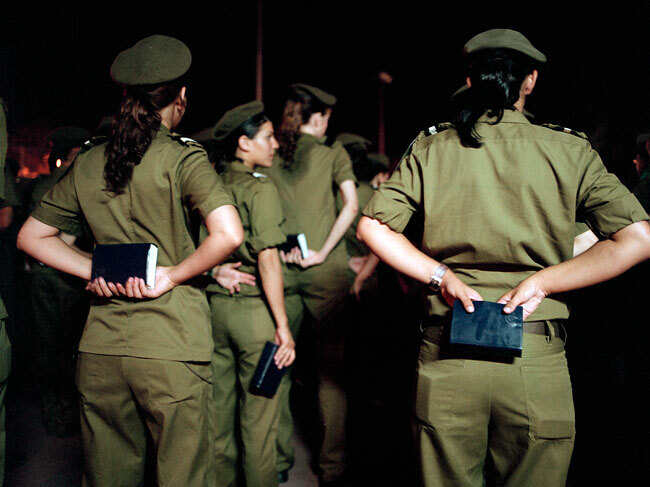 Female soldiers receiving their Bible. On the corner of the Bible (near the girl's thumb) is the seal of the Israeli Defense Forces. The Tanach (Bible) I received from the IDF after completing basic training. Perhaps the most moving moment in a soldier's career is the moment he or she is sworn is as a soldier of Israel. Standing at the Western Wall of the destroyed Holy Temple or at the ruins of Masada, the young recruit receives his/hers basic survival tools; the M-16 rifle and Hebrew bible. These two tools will be with them throughout their service. Both are an essential part of who we are as a people. In this Bible, this Torah, they will read about their ancestors, who fought on the same land, for the same causes, the same values, the same principles. The heroic tales of old will inspire and guide them.